This page hosts extensions, tools and scripts to alter and hopefully improve your site experience. If it's hosted here it should work on all browsers that the tool has been tested on. If they don't, or if you need the script to support your browser and it doesn't, report any bugs to the Tech Staff and they'll work on a fix. An attempt to screw with your browser, your computer, or your life. Nor is it a vast conspiracy to steal those pics of you at the beach wearing nothing but a small guinea pig and assorted fruits. Seriously, these don't do anything other than modify your user experience on the SCP wiki. An extension is a fully-fledged addition to your browser that is installed from your browser's extension and/or app store. Extensions will automatically update. Description: A modular stylesheet picker that lets you independently adjust the layout, color scheme, logo, fonts, and rating module visibility. Includes sync capability so your preferences carry across browsers so long as you're signed in to Chrome or Firefox. Install S-CSS-P as an add-on to your default browser. For Opera users: Use the Install Chrome Extensions add-on and use the Chrome Link. For Edge users: Coming soon. For bugs, tips or comments, contact pxdnbluesoul. Description: Overwrites the default theme of the wiki and swaps it for a darker color scheme. This is only an aesthetic change and does not effect functionality. For further details on it's development, please follow the debug thread on the wiki which shows what it is and is not capable of. Install Stylish as an add-on to your default browser. Any other browsers, find them yourselves. Enable Night Mode from your browser's Stylish drop down menu. For bugs, tips or comments, contact anqxyr or LurkD. Browsers don't know how to run userscripts by default - to teach them how, you'll need to install an extension that manages them. We recommend Tampermonkey, which works for most browsers. Other userscript managers are available, but it is not guaranteed that these userscripts will work for those. Click the button labeled '+ Add to Firefox' to install Tampermonkey. Click the button labeled 'Add to Chrome' to install Tampermonkey. Click 'Install now' to install Tampermonkey. Click the button labeled 'Add to Opera' to install Tampermonkey. Click the button labeled 'Get' to install Tampermonkey. This will install the base you need to be able to run the scripts linked here. Pick the userscript you want and click the link labelled "Click here to download/install". You should be redirected to Tampermonkey. Click "Install". If you are not redirected, and the file simply downloads itself, then Tampermonkey is not correctly installed. If the userscript fails to install for whatever reason, let a Tech Team member know. Refresh the page, and your userscript should be active. If at any point you get redirected to a page that says "A userscript wants to access a cross-origin resource. ", click "Always allow" in the bottom left. You'll have 20 seconds in which to do this - if you run out of time, don't worry, it'll pretend you said "no" and ask you again when it needs to. This script works on both the SCP Wiki and on O5 Command. Description: Inserts a small textbox and button next to your account information at the top right of the screen. Jumpbox allows you to instantly jump to any article you want. Typing in only numbers will shoot you off to the relevant scip. Typing in a mix of letters and numbers, or only letters, will get you that page. So 'chat guide' will get the chat guide. Note that Wikidot takes care of the spaces in there, converting them to dashes. Both an ENTER keypress and a click on the button work to submit. Note: it doesn't check whether or not the page exists and it doesn't provide anything in the way of spelling correction. Preface a title with [modifier]| to get a specific type of article. When you want the tale '827' by A Fat Ghost and not SCP-827, typing t|827 will get you exactly what you want, whereas just the number, or SCP-827 will get you the scp. h: for hub pages (i.e. typing in h|unfounded should get you the Unfounded Canon hub page. If you use any other modifier, it ignores it and acts like you only requested the page you specified after the pipe. I.e. typing o|chat guide will get you the chat guide, ignoring the unknown modifier. 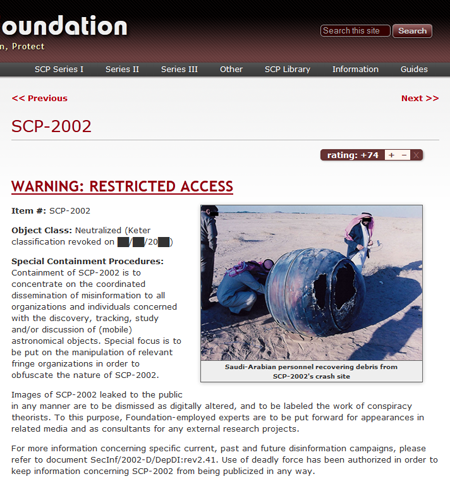 Description: This provides "« Previous" and "Next »" links at the top of any mainlist SCP article. Works fairly fast, but does get slower when there's a lot of [ACCESS DENIED]s between the current page and the next eligible article. This is really only a factor in Series 3 at this moment. Description: Adds a small envelope image to the right of usernames produced with the Wikidot [[user XXXX]] and [[*user XXXX]] syntax. Click on the envelope to go directly to a new Wikidot PM addressed to that user. Description: Tells you whether or not there's still a title on the Series pages for articles that have been deleted. Inserts a div at the top of the page telling you that either there are no dead links, or the slots that still have a title, but no corresponding page. Description: Hides the rating module, and modifies the rating link at the bottom to not show the current rating. 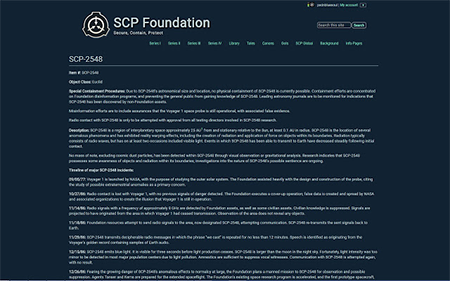 Description: Replaces the Wikidot karmabar with one that signifies how many succesful scp, tale and goi-format pages a user has written for the wiki. Also adds a textual representation after the username. This may help you determine the amount of experience a user has when it comes to writing for the wiki. However, that does not necessarily mean users with low author karma are inexperienced. The last time the database was updated was 22nd June 2017. 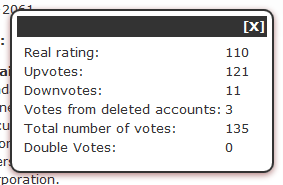 Description: Adds a clickable text underneath the rating module for a page, that tells you more about its real rating including how many up- and downvotes it has from active members, how many deleted accounts voted on the page, and whether there are double votes. Description: Records and displays whether you've already read an SCP article (-J etc. included). Displays an icon to the left of the page title, with a green checkmark for articles you've read, a red X that you can click to manually mark the article as read, and a button to the far right of the title to toggle automarking articles as read as you view them. Now also adds a green checkmark on Series pages to show you've already marked an article as read.